Parker J. Palmer, founder and Senior Partner of the Center for Courage & Renewal, is a world-renowned writer, speaker and activist who focuses on issues in education, community, leadership, spirituality and social change. He has reached millions worldwide through his nine books, including Let Your Life Speak, The Courage to Teach, A Hidden Wholeness, and Healing the Heart of Democracy. For the past few years, I have followed Parker J. Palmer on Facebook. He is someone who helps me focus and stay calm, when the world seems crazy and unbearable. In the past week or so, he has had a couple of poems that I have loved. I gave you the beginning and the end, then a link for the whole poem. Another one I loved was "Sometimes" by David Whyte. You can read that poem here. 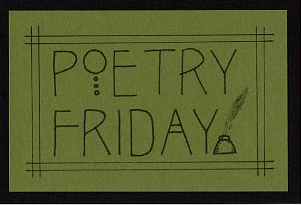 Poetry Friday is at Book for Learning today. For about the past five summers, I have participated in #cyberPD. 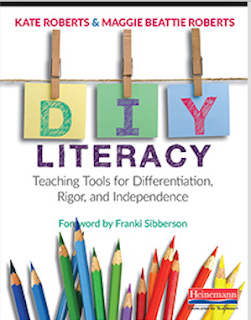 This year, we are reading DIY Literacy: Teaching Tools for Differentiation, Rigor, and Independence. I'm way, way, way behind in my posts, but better late than never, right? 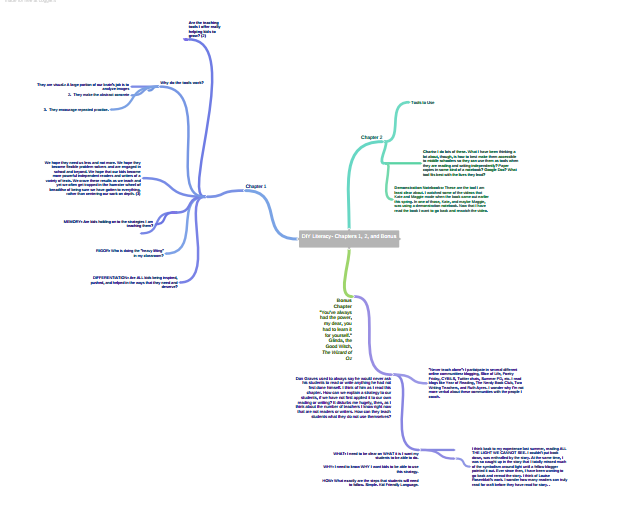 Lots to think about in chapters three and four. First, I thought about myself and my teaching. I loved this quote: Last paragraph on page 51. It is tempting to fall into the trap of getting exasperated when students do not remember past teaching. Before we know it, we have rolled our eyes and said, "But I already taught you that!" However, as educators from Chris Lehman to M. Colleen Cruz remind us, if we had really taught it, then kids would be able to do it. They would have learned. I'm thinking about using that at the bottom of emails at the beginning of the year. I may or may not do it-- a little worried that it might be too accusatory and might put some folks on the defensive, but I definitely want to post it somewhere where I will remember to look at it every day. I continue to be intrigued by the idea of micro-progressions. Thinking that it might be true that before I can create microprogressions, I need to really decide which reading and writing skills are the most important for kids to learn in each unit. I do lots of backward planning with teachers. We work really hard at deciding what we want students to know and be able to do. This year, I want to work harder at creating microprogresions and charts to go with those strategies and skills. Maybe the most important thing about deciding which skills we are going to teach is deciding which lessons and skills are NOT important to learn. And then NOT teaching those. After we decided exactly what we wanted to teach, Kate and Maggie's question, "What evidence of my teaching do I see in this student work?" seems like it would be a logical next step. I could see using the question, during data team meetings. I wonder what it would be like to say, "OK, so you taught X this week during writers' workshop?" Bring your student notebooks and let's look for evidence of your teaching. How many kids have got it? How many kids are on the way but need a little more support? And how many kids are not using that skill at all? 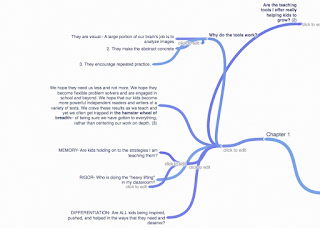 How might looking through that lens change us as teachers? I also wonder how this question might work as a tool for coaching. I see this on two levels. First, I see myself stepping away from a teacher's classroom and asking myself, "What evidence of my coaching do I see in this teacher's work?" I work with some teachers where I could answer that question easily, but then I work with some teachers where I don't think that's necessarily true. Even after four years, I don't see much evidence of my work in their teaching. And I wonder what I need to change. A couple of ideas come to mind, e.g. I need to be more deliberate about helping teachers set goals for our work together, both long term and short term. And we need to revisit those goals often. I have been surprised, over the past four years, at how much I have enjoyed working with our middle school students. If I had to describe these kiddos in one word, I would choose "wonderful" but I would also have to admit that most of the time, they are also more than a little scattered. And they move from room to room, which makes them even more scattered I'm trying to think how our middle school team could set up some kind of notebook (not sure whether it would be a physical notebook or a digital notebook), where kids would keep some kind of replica of the processes/strategies they have learned. It might even be pictures on their phones. Could the repertoire charts go on a bookmark and then they could refer to a wall chart or page in their notebooks for the actual process? How do I help teachers physically incorporate the step of asking kids to look at the chart before they start to read, and to assess themselves on how they used it afterwards? I had to admit that I was more than a little reluctant to read this chapter. Rigor is all the rage in Colorado right now, or at least in my district. Unfortunately, most of the time it falls into the first category described in DIY Literacy, "The first (type of rigor) focuses on the difficulty of the task that students are being asked to accomplish. There are many ways to make the task more rigorous: elevate the text complexity, raise the standards, increase the volume of writing... yet a conversation around rigor that centers on the difficulty of the task or text leaves out the performance, engagement and agency of the learner" (54). Kids are asked to read really, really hard, and also really, really boring texts (think along the lines of LITTLE WOMEN), that most adults would never, in a million years, choose to read, let alone write about; then after they sort of read them, they are expected to write reading responses and/or essays comparing them. Kids totally disengage, and then we complain that their thinking is not rigorous. I am much more comfortable with Roberts' and Beattie Roberts second definition of rigor, "Alternatively, we focus on the second form of rigor as a description of a behavior rather than a description of a task. Rigor is performative-- it is a stance, an action, a state of being that is taken to move through the world, tackle tasks, or work toward a goal. And when we focus on the work and effort that students put into tackling a task and not just the task itself, we create opportunities to really see what's difficult for kids" (54). They go on to say, "Rigor has at least two components: (1) The difficulty of the task at hand and (2) the persistence and dedication of the students working toward that task. Without this second layer, it won't matter how advanced our instruction is or isn't; if the kids aren't working hard, there is no rigor (69). I wonder how I can work these ideas into conversations at my school and district. I also love the idea that "Rigor is relative. It's important to honor the fact that rigor looks different from classroom to classroom and from kid to kid. What is simply a breeze for one student is a mountain of difficulty for another. We miss the mark if we only talk about rigor as a monolithic, static thing (66). What's rigorous for one kid, may not be rigorous for another. If we truly are differentiating, if we truly have adopted a growth mindset way of thinking, then we need to help teachers and kids define rigor, and work toward that, for themselves. Finally, I'm intrigued by Cathy Mere's comments during the Twitter chat last week. Cathy talked about the microprogressions as a tool for professional development, then followed up with this thinking in her post last week. .My district has begun using exemplars more heavily as a tool for data meetings. I wonder, though, whether microprogressions might also play some kind of a role in these meetings. I am a wannabe artist. That is to say, I think a lot about doing art, but rarely get around to doing much. Every once in a while, I stumble across a book that makes me think a little harder. That's what happened last week. I had gone to an independent children's bookstore in my area to pick up a professional book. Of course I wandered back to the poetry section to see what might be new and interesting. 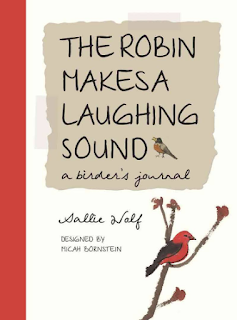 I came across Sallie Wolf's THE ROBIN MAKES A LAUGHING SOUND: A BIRDER'S JOURNAL. I thought it was a new book, then discovered after I brought it home that it was actually published in 2010. So I guess it's an old, but new to me book. In an author's note at the beginning of the book, Wolf says that she started watching birds in seventh grade, when a seventh grade teacher introduced them to Roger Tory Peterson's A Field Guide to the Birds of Eastern and Central North America. Her class actually set up a bird watching/banding station on the roof of her school, and she has been watching and journaling about birds ever since. About that same time, Wolf also began keeping journals; and her journalling process is described in another author's note in the back of the book. 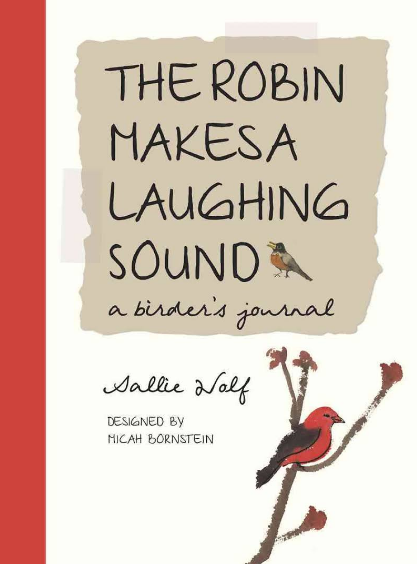 THE ROBIN MAKES A LAUGHING SOUND is organized by seasons. 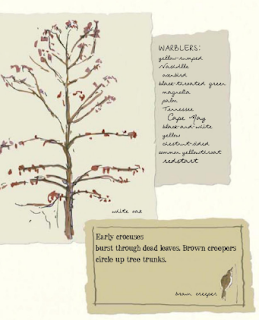 Each season begins with a handwritten list of birds Wolf has seen, as well as several water color sketches. The list pages are followed by journal entries or lists that are growing into poems, and finally, finished poems. Some are haiku, others are free verse, a few rhyme. "The Robin Makes a Laughing Sound"
a safe, dry ledge to hold its nest. I always stop to look around. 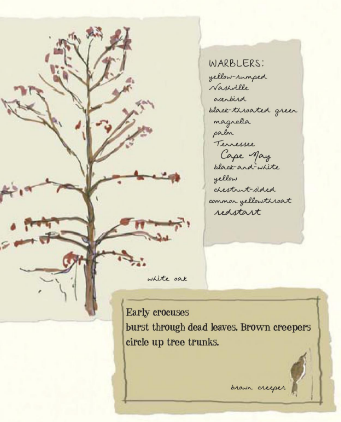 I love the idea of keeping a journal that includes words, and pictures, and water color sketches. I wonder what my middle school kids, or the art teacher might do with it. Maybe someday I will even try it myself. Mary Lee is hosting Poetry Friday at Year of Reading today. I'm super late getting started on my DIY LITERACY posts. I bought the book about three weeks ago, fully intending to start reading right away, which I actually did. 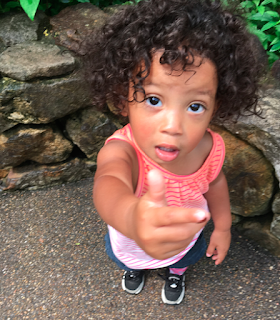 But then my granddaughter came to town. Esveidy lives in Phoenix, and her mom graciously said that she could come stay with us for a few weeks. She and I had a blast playing in the children's area at the Botanic Gardens and visiting the zoo and the Children's Museum and the Butterfly Pavilion. But I didn't get much done when she was awake. She's an early riser, just like her grandmother, so our days started around 5:30; that also cut into my writing time. And then I had technology issues. About a month ago, I attended a workshop put on by our district IT department. One of the sessions I attended had to do with thirty tools that you could implement quickly and easily in your classroom. I love these kind of sessions, but the trouble is, I rarely implement what I learn afterwards. I decided this time that I was absolutely going to use a few of these tools this summer. 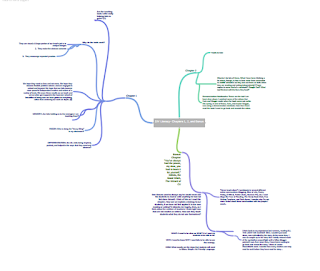 When people's posts started cropping up last week, it seemed like there were a lot of mind maps. 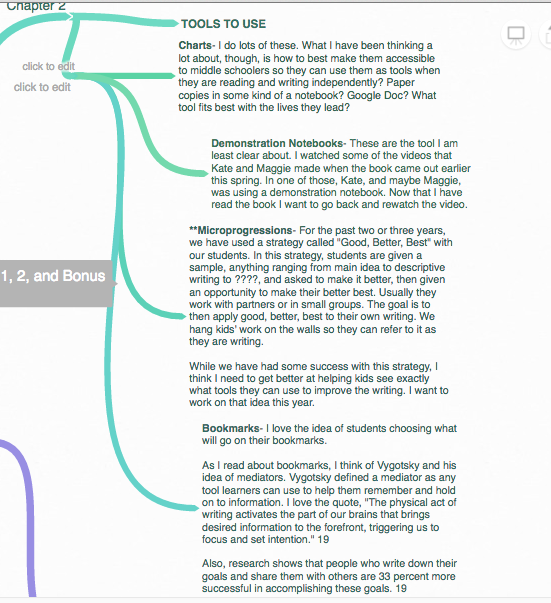 I decided that I would use one of the tools we had learned to create my response to my first chapter. 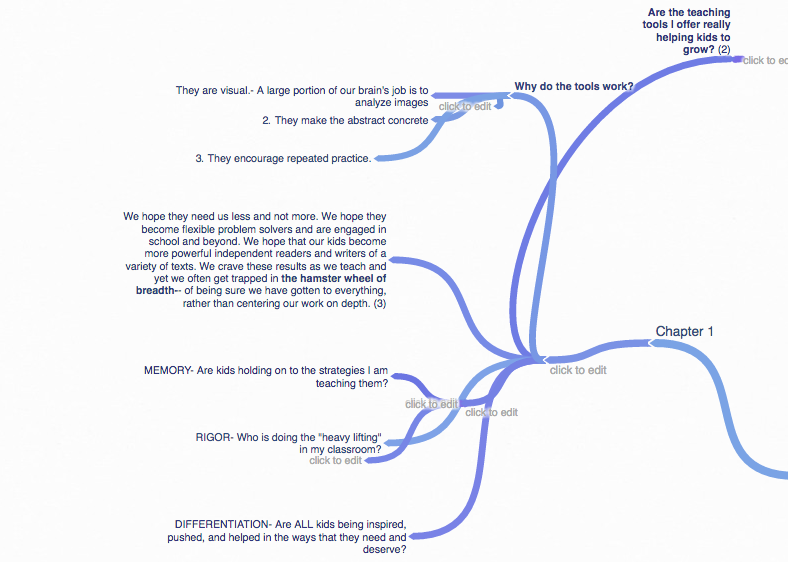 I selected a mind mapping tool called Coggle. I watched the tutorial, logged on, and jumped right in. And ummm, should I say it didn't go quite as smoothly as I had hoped? That would be putting it mildly. Typically, when I write a blog post about a professional book, I annotate in the book, and then go back and shape the information into a post. That's what I tried to do with Coggle. I struggled however with the actual tool. Supposedly, it's really simple to add branches, just by clicking on a plus sign. And then you can grab on to the branches and move the branch to where you wanted it to be. I found both of these things relatively easy to do. There was lots, however, that I did not find nearly as easy. There was a circular toolbar thing that would come up around a branch. You could use it to remove branches or change the color. Sometimes I could get that toolbar to come up. Sometimes I couldn't. And I never knew what I did differently when it came up than when it didn't, despite the fact that I watched the original tutorial at least three times, and then several other tutorials I found online. Same with deleting branches. Supposedly, you could simply rotate the plus sign that added branches until it became an X, and then you could click on it to delete. Sometimes I could get the X to rotate, and sometimes not. Once, I deleted a whole chunk of quotes I wanted from chapter 1. Struggling with Coggle did make me apply what I was learning in DIY. What if I had had some kind of bookmark, or one page tool to help me understand the features of Coggle. I watched the tutorial again and again, but I couldn't seem to hold onto the information. Second, I thought about how the tool has to match the learner. I'm not a linear thinker, at all, in fact, I'm pretty random. I'm not sure then, that, a mapping tool like Coggle will work for me. I have a more linear structure that works for me. I wonder, though, how often I try to force kids to use my thinking or organizational processes. Finally I thought about authenticity. That was the word that pounded in my brain as I was reading. I am a reader. I am a writer. 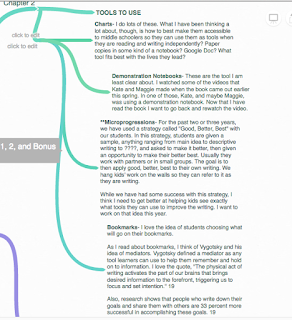 I can talk to kids easily about my own reading and writing processes. At the same time, I know lots of teachers, including some that I coach, who are NOT readers or writers. What about them? How can they talk to kids about their reading and writing strategies? People who know me, or who follow my blog, know that I am a long-time teacher, who has spent my entire career in urban settings. They also know that I am Anglo, never married, and that I have two sons, African American, that I adopted in 2003. My sons are now almost 21 and 22. I am heartsick very time I read of the death of another African American man at the hands of police. I talk to my sons often, as best as an Anglo female can, about how to behave around police. I am afraid every single time they leave my house. And yet at the same time, I am no less heartsick when I read the news of last night's events in Dallas. I imagine spouses who have spent a sleepless night in hospital waiting rooms, people who will be making funeral arrangements, little children waking up to learn that their daddy or mommy will not come home. This morning, a friend posted this quote from Alan Paton's novel, Cry the Beloved Country, first, published in 1948. I read the quote and found my poem for today. Katie, at The Logonauts, is hosting the Poetry Friday Roundup today. Esveidy has been here for two weeks. I have promised myself I am going to really treasure this time. Not miss one single minute. I think I pretty much have. We have played in the water at the Botanic Gardens. And splashed in the fountains at a neighborhood shopping area. Been to the Denver Zoo. And the Cheyenne Mountain Zoo. Read books and books and books. Blown lots of bubbles on the porch. Today my book club had a birthday party for her. It's really not her birthday until November, but we had fun. We ate hot dogs and hamburgers. Books and an alphabet puzzle and stacking rings that talk. and I won't see her again for months. by her level of engagement. he was working on climbing stairs standing up. We must have done the stairs a hundred times. And then it was blowing bubbles. Yesterday, she worked on the buckling the straps in the stroller. She did it again. And again. And again. Buckle. Ask for help to unbuckle. Buckle again. Even at the zoo, where there was so much to see. Buckle and buckle and buckle. Repeating until she figured it out. so that the bubbles would come out. Clapped and cheered when she accomplished her task. "Learning is nothing more than success remembered." And I wonder why school has to be so different.